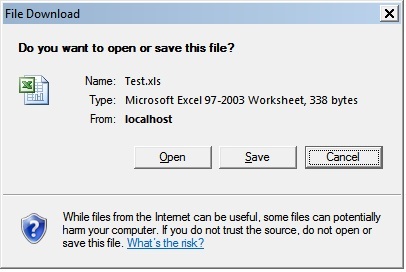 There is a two simple function written below, which takes datatable as a input parameter and give it popup to user to save the file as an excel file. 1. This method work well in page. Copy and paste file in your code, and call this function on Event where it required. //Get the HTML for the control. //Write the HTML back to the browser. Once click on the event and call the function, it gives you popup window to save file into your local drive. Now user has choice to open and save the file into excel format. 1. The second method work well in user control. Simple Copy and paste the code with enough and call the function on Event where it required. No sure from server side code, But we also need to check it save in client machine which may not have D drive. Found this link, which exports data to excel in asp.net. Not just “.xls” but it will export data in “.xlsx” version too. can i store excel file in solution explorer and then make a zip file of it????? Amazing code, worked in the first shot! Thank you! Thanks Man It saved my day. Thank you so much for your code it was very helpfull to me. Thanks… useful code for me. your blog posts. In any case I will be subscribing in your feed and I’m hoping you write once more soon! Yes it allow you to save the file into local disk.